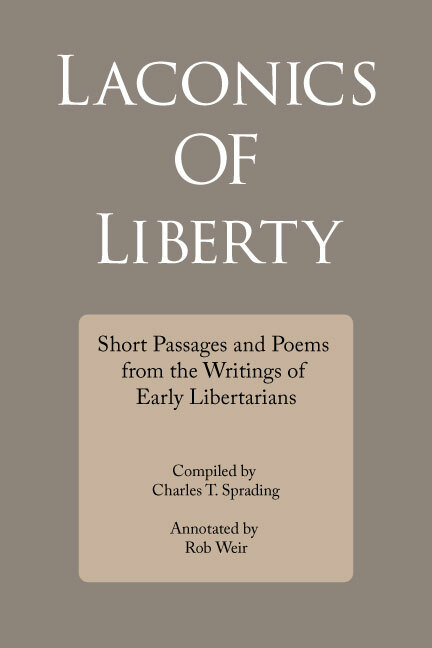 Here is a vintage collection of short, pithy lines (“laconics”) on the topic of liberty, as originally assembled by Charles T. Sprading and included in his 1913 Liberty and the Great Libertarians. Represented are authors as diverse as Voltaire, Lord Byron, Charles Sumner, Richard Wagner, John Peter Altgeld, Victor Hugo and Algernon Herbert. Each item is annotated and accompanied by a brief biographical sketch. I also attempt to trace each quotation back to its original source. This is the message of liberty in its most distilled form. Short items like these commonly appeared in the activist newspapers of the day, in trade union journals and in pamphlets, filling in the odd space here or there on the page. A wide range of traditions are represented. There are socialists, labor activists, mutualists, voluntaryists, Georgists, syndicalists, free thinkers, free speech activists, abolitionists, liberals, social reformers, secularists, anti-imperialists and other assorted radicals. These are not all libertarian in our modern sense of the term. This is more of a first-cut of libertarianism, at a time when a wide range of radical traditions were vying for adherents. Nevertheless, there is something here for almost anyone to enjoy, whether right-libertarian or left-libertarian, whether anarcho-capitalist or anarcho-communist. This is part of our common heritage. I hope you will enjoy this short read, and gain a greater appreciation for an older, messier tradition of libertarian thought. Please enjoy these choicest pearls from the lost literature of liberty!